What are YAKERS made from? Why are some YAKERS different in colour and why do they smell smoky? YAKERS are smoked in the Himalayas using traditional methods. Each chew is laid on drying racks and they dry through the use of traditional smokers. The chews are moved up in height weekly over a 4 week period as they dry so that they are further away from the smoker, so the difference in colour shouldn’t be too great, however a darker colour just means that they have had more smoke than others. This colour may vary slightly from batch to batch too. Why do YAKERS have the dimples on the sides? This happens when the cheese is being compressed into blocks as it is wrapped in muslin cloth. What is the best way to store YAKERS? Keep your YAKERS in a cool and dry place. These products get better with age and last longer the older they are which is why there is a 5 year shelf life on them. How old does my dog have to be for YAKERS? YAKERS are suitable for all dogs over 4 months old. Are YAKERS high in fat as they are made from Cheese? YAKERS are low in fat at only 5.2%, the cheese used is made from skimmed milk as all of the cream is removed as part of the process. Salt in large amounts is harmful for dogs as it is for humans. However in YAKERS we only use a tiny amount of salt along with lime juice to get the cheese to coagulate (harden) at the very start of the manufacturing process. The salt content in YAKERS is less than 0.1%. 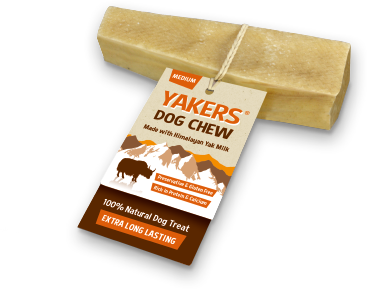 Not all dogs are lactose intolerant, but if they are there is less than 1% Lactose in YAKERS. The reason is that both the Cream and the Whey are removed from the milk as part of the manufacturing process, meaning that the levels of lactose are very, very low.